In the trying post-war period, reusing and adapting the good old coconut design might have been a option too attractive to pass up. 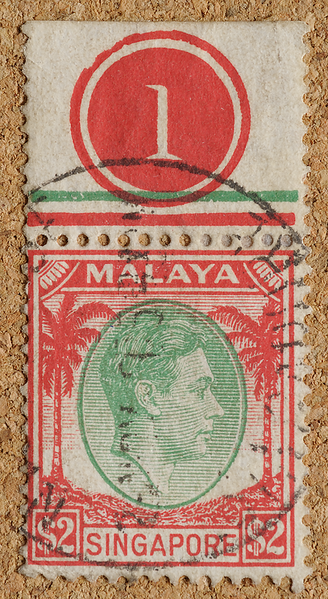 A telegram (British Postal Museum & Archive accession number POST122/7689) dated 15 May 1947 from Sir Edward Gent, Governor of the Malayan Union, addressed to the Secretary of State, Colonies, reads: Governments of Malayan Union and Singapore agree in principle to the establishment of new Local Postal Union to be styled (Malaya) and agree to ask Crown Agents for the Colonies to proceed at once with execution of indent for Singapore stamps and to prepare printing material for Penang and Malacca (in anticipation of receipt of an indent for these issues) based on former Straits Settlements design, but now with (Malaya) in top panel and Singapore, Penang, Malacca as the case may be, in bottom panel. A study of ellipses in Christmas colours. 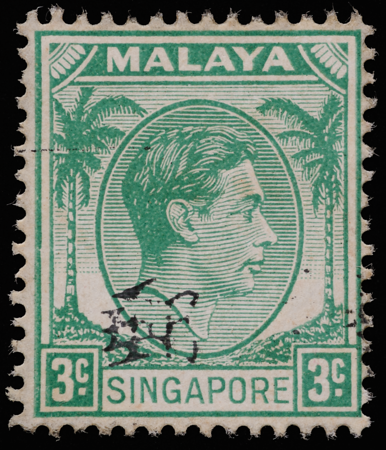 The first batch of stamps for Singapore, as well as Penang and Malacca, were ordered in October 1947 (Crown Agents Stamp Bulletin No. 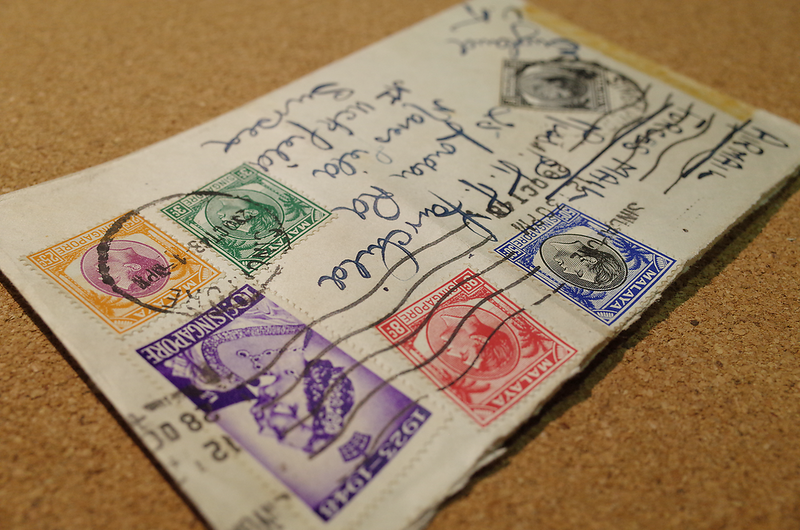 178, British Postal Museum & Archive accession number POST122/7689). The rebirth of the coconut duty plate would turn out to be one of Sir Edward Gent's final legacies. On 4 July 1948, on his way back to Britain, he was killed in a mid-air collision. 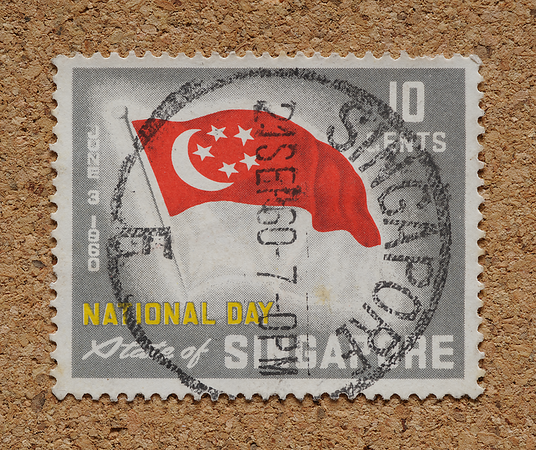 Less than two months later, on 1 September, the first stamps ever inscribed SINGAPORE were issued. This was a momentous event for the coconut definitive, for it became the only design to ever truly cover the whole of Malaya. Singapore would later chart its own political destiny, but its geographical and cultural affinity to Malaya are eternal. The typeface of SINGAPORE is similar to but slightly squatter, more angular and more formal than the International Typeface Corporation's Franklin Gothic Medium Condensed, which was used in the end credits of the animated sports comedy film Space Jam in 1996. De La Rue's version of SINGAPORE also has slightly more consistent stroke thickness and more even kerning than the Franklin Gothic. 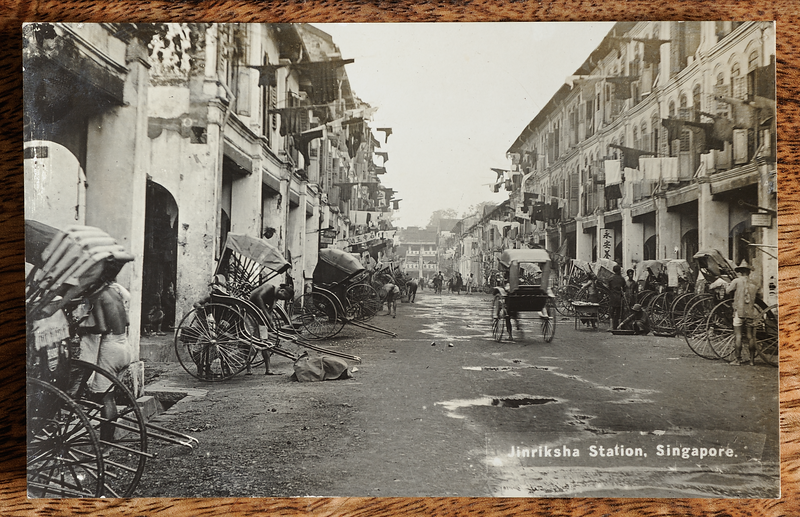 Rickshaws languishing along grimy Sago Lane in Chinatown (circa 1920), fermenting under the oppressive humidity of wet laundry. Rickshaw pullers had a hard life and meagre earnings. Luck seemed to have helped the Singapore coconuts come into being. To begin with, the British had decided in 1946 that Singapore was to be administered as a standalone Crown Colony separate from Penang and Malacca, which were considered Crown Colonies under the new Malayan Union. In fact, on 19 June 1946, a letter from Assistant Under Secretary of State Sir John Paskin to the Director of Postal Services (British Postal Museum & Archive accession number POST122/7689) had stated: It is the intention that in future the stamps to be used in the new Colony of Singapore should bear only the title “Singapore”. If this policy had gone into force, Singapore would have been ineligible for the universal coconut duty plate with its MALAYA inscription at the top. 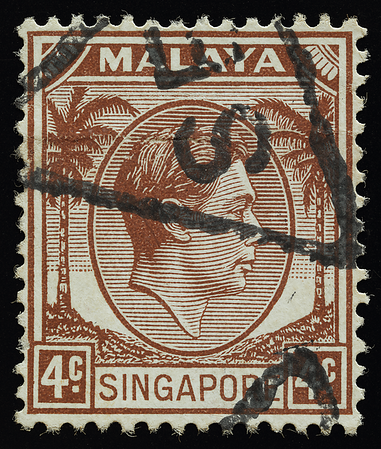 One of the grotty but robust triangular cancels used throughout the British Empire for printed matter, SE probably denoting Singapore. These cancels were for non-personal mass-printed materials like magazines and newsletters, which enjoyed discounted postage rates. 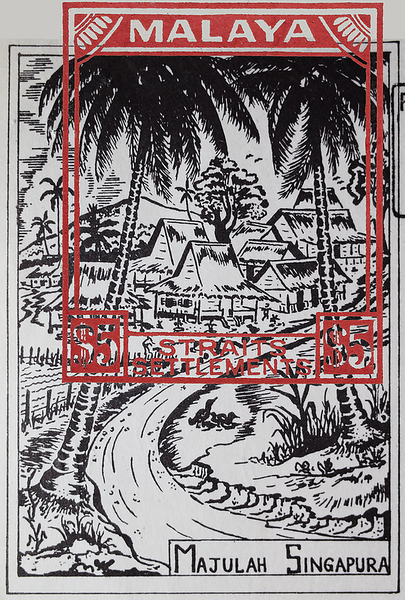 Both postmarked in 1960 are this coconut stamp in Singapore's national colours and a first-anniversary stamp of the State of Singapore. By then, Singapore was no longer part of Malaya, and Lee Kuan Yew had been sworn in as prime minister. 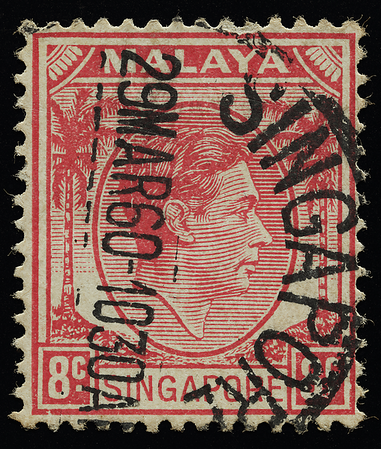 Singapore coconut definitives were finally invalidated on 1 August 1961 (Stanway 2009). 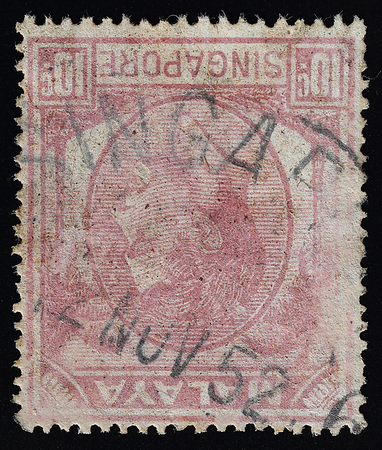 ‘Mint Never Hinged', ‘Very Fine Used' and other such decorations are highly coveted by stamp dealers and collectors. But there are the stamps that have endured half a century of hardship in the tropical heat and humidity. They have a rugged, uncosmetic beauty, like a sunburnt, dirty and sweaty Zhang Ziyi after the fight with the desert bandit in Crouching Tiger, Hidden Dragon. Season's greetings from Christmas Island (also see bma) in December 1948. 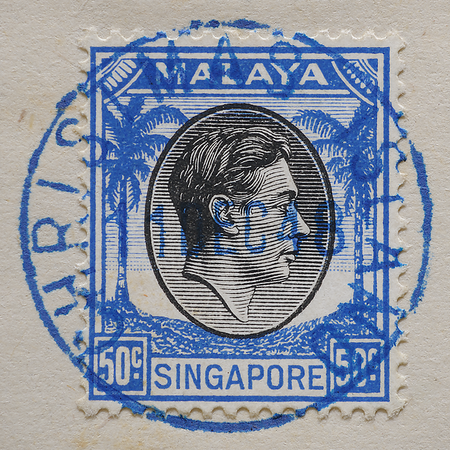 See bicolours for colour schemes that made their debut on the Singapore stamps. 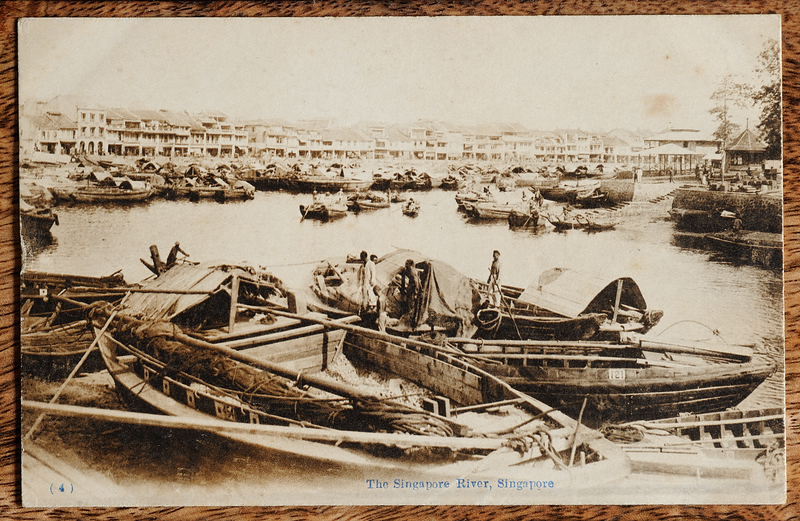 Singapore had more than 200 kampongs in their heyday, throughout the main island and the surrounding isles. A flamboyantly addressed cover sent by a soldier, festooned with stamps in all the colours of the rainbow, including coconut definitives printed in all three dies (single plate, double plate and hybrid) and canceled by both hand and machine. 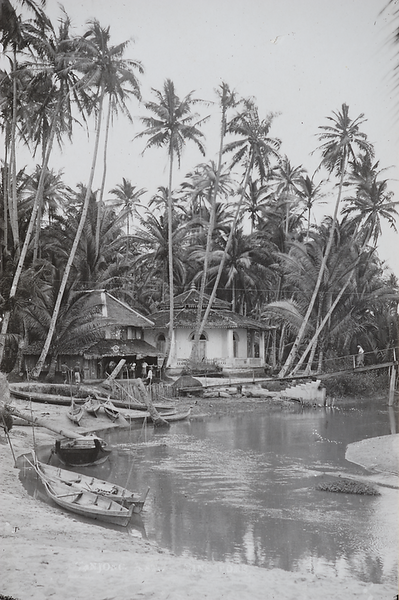 In 1933, the designer of the coconut definitive might have stood gazing at the two coconut trees framing this idyllic kampong scene. In the late 1960s, it had become an illustration on a postcard despatched overseas by the Singaporean government to acknowledge radio reception reports. 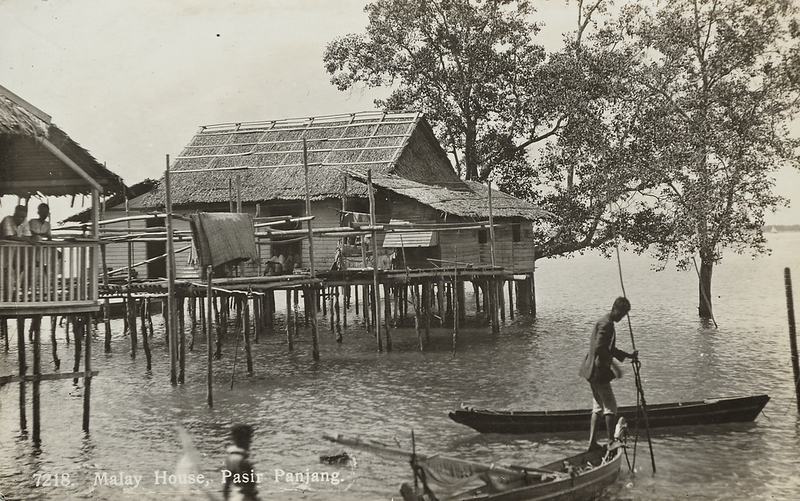 Despite the frenetic urbanization and economic development of the newly independent nation, kampongs and coconut trees continued serving as ambassadors for the country. 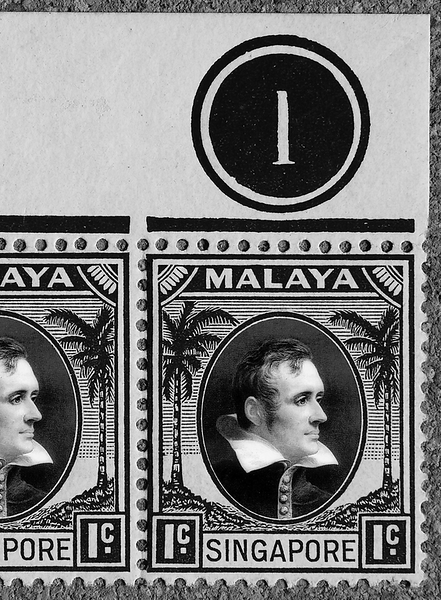 Stamp issued by the Coconut Action Party in 2019 to mark the bicentennial of the founding of modern Singapore in 1819. Painting of Sir Thomas Stamford Raffles by James Lonsdale exhibited at the Royal Academy in 1818.